Indian cuisine is about as easy to explain as thermodynamics. Over 5,000 years of history, India has welcomed a multitude of settlers with a variety of belief systems. In order to understand the evolution of the indigenous cuisine of India, one must realize this country is anything but homogenous. Regions and religions make up a large portion of the cultural fabric of the food. “Indian food” has been coined a phrase that a native would surely laugh at because such a phrase would be like saying to a sommelier “North American wine.” Like Napa, Sonoma, Columbia, and Anderson Valley, for example, there are many areas within India that have its own unique cooking methods, spices, and local ingredients. Tipping the population scale at over one billion, the diversity of its food is as diverse as its people. Hindu and Muslim are the two dominate religions that have influenced Indian cooking and food habits the most. With each migration of settlers, they brought with them their own culinary methods. The Hindu vegetarian culture is widely practiced. Adversely, Muslim tradition is the most dominate in the cooking of meats. Mughlai food, kabaas, rich Kormas (curry), and nargisi kaftas (meatballs), the biryani (a layered rice and meat dish), rogan josh, and favorite dishes prepared in a clay over or tandoor are wonderful contributions made by Muslim settlers in India. In South India, the cuisine is largely rice based with an accent of a thin soup called Rasam. Coconut is an important ingredient in all South Indian cuisine. Dosa (rice pancakes), Idli (steamed rice cakes), and fermented rice are very popular dishes with Hindu vegetarian dieters. The Portuguese, Persians, and British made important contributions to the Indian culinary scene as well. The British, for example, introduced tea or chai to India and it is the favorite drink of most Indians today. North, East, South and West are the four different main regional styles in Indian cooking. North India was influenced by the Moghuls dynasty that ruled India for three centuries until the British replaced them in the 1800s. Saffron and rich gravies made of pureed nuts and cream were all derived from the Moghuls. Naan bread, which is made in a tandoor, is not indigenously Indian. It is the everyday bread of the Afghani people. Naan is not the homemade daily bread of Indians, yet for decades, this has been a mass misperception of Indian food outside the country. South Indian food is the antithesis of Northern Indian food. Their distinctive rice crepes and steamed rice cakes have been a favorite amongst Southern Indians. Rice is eaten at all meals, and lunch is often three courses, again each served with rice. Hindus are divided into meat and non-meat eaters. Their common thread in the Southern region of Kerala is coconut, which is the culinary mascot of the state. The Western states of Gujarat, Maharashtra and Goa all have unique food experiences. Gujarat is mostly Muslim, Parsis, Hindu, and Jains, which each having their own method to cooking. Parsis have a rich diet of chicken and seafood, unlike Jains, who are strictly vegetarian for religious reasons. Gujaratis are predominately veggie eaters and Gujarat is celebrated for being one of the best places to eat vegetarian food. Maharashtra is a huge state with its fame capital Mumbai (formerly known as Bombay). This large region has five-star hotels and restaurants that incorporate coastal favorites such as a variety of seafood dishes with a slash of red chilies and a healthy helping of coconut. 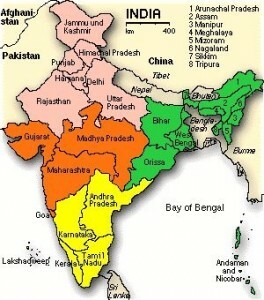 Eastern states such as West Bengal, Orissa, Bihar, and Jharkhand are quite different from each other. Bengali cuisine can be described as delicate and subtle, with fish and rice at the center of the diet. The order of a Bengali meal begins with a mixed vegetable dish with a bitter flavor and ends with a rich milk-based sweet dessert that Bengali is famous for. Orissa is known for squash blossoms dipped in a paste made with rice and deep-fried or made into patties. Fish and other seafood are also dietary stables. Chicken is very unlikely to be served here and in general meat plays a minor culinary role. Bihar and Jharkhand enjoy their vegetables and beans, however they have Western overtones with their diet including beef, pork, goat and chicken. From East to West, Indian cuisine seems to be only united by its locale, but its flavor is clearly boundless. During the month of February, join me as I explore the cuisine of India and see why it is you will soon love. This entry was posted in Foodtography. Bookmark the permalink. WOW! This article is quite enlightening. I have eaten at several Indian restuarants; however, I feel more educated to what I’m eating. Not only does the article provide background information on the food and spices, it also provides a bit of history of the lay of the land. I found this article very fascinating. Great job! I SAW THESE ARTICLE, IT IS SOME KNOWLEDGEABLE AND EDUCABLE. I THINK INDIAN CUISINE`S ARE MORE VERSE AREA AND IF THAT KNOWLEDGE WILL SHARE TO ALL OF VIEWERS, IT WILL BE BETTER FOR WORLD. What about the NORTH EASTERN part of the country which consists of seven sisters? It is only fair if you include that too. From the delicious bamboo shoots to lotus stems. Very good and simple article that provided a good background on how Indian food got to be the way it is.